Raspberry Champagne Cake – champagne infused cake with raspberry champagne buttercream, raspberry drip glaze, fresh raspberries and whipped cream. 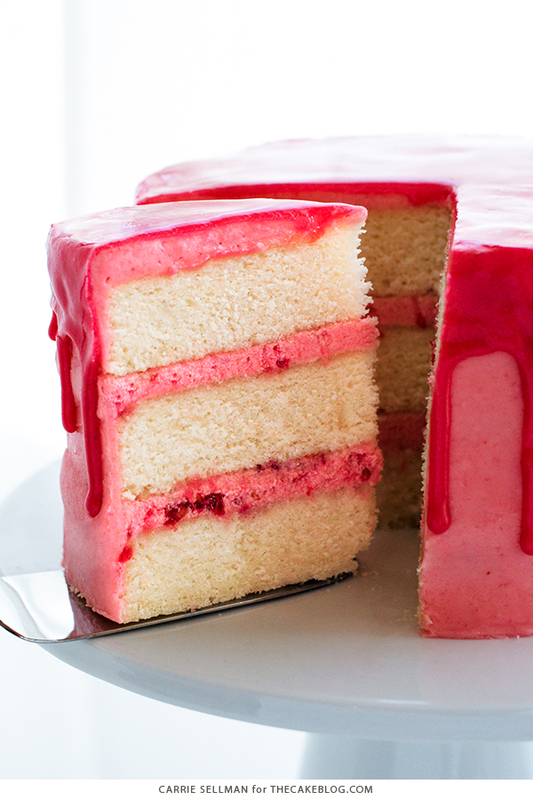 A new layer cake recipe perfect for Valentine’s Day! Nothing says I love you like a homemade cake. Except maybe a fabulous homemade cake with champagne, berries and cream, topped with a drippy pink glaze. Whether you’ve found the love of your life or are celebrating February 14th with your best gal pals, today’s recipe has Valentine’s Day covered. A light and airy champagne cake finds its perfect match with a dreamy raspberry champagne buttercream. Fresh raspberries are pureed and simmered with bubbly, straight from the bottle, to create a reduction that works amazingly well in both the buttercream and the glaze. The flavors in this cake build with each individual component, creating something undeniably raspberry and truly delicious. Plus, that pink hue from the berries is love at first sight. This cake is a big one, definitely meant for sharing. What better excuse do you need to slow down a bit, take a break from all the chaos, and experience joy in the moment. We often get so caught up in the craziness of everyday life that we miss everyday opportunities to experience joy. So gather your besties or invite over your closest couple friends and make this Valentine’s Day the best one yet. 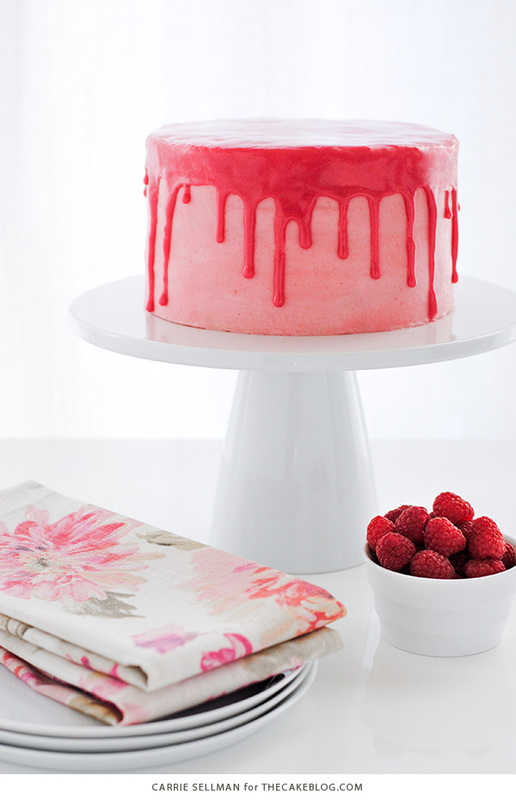 Because this Raspberry Champagne Cake – and joy – are even better when shared. No matter how you do it, take a moment to celebrate those you love and spread some Valentine’s Day joy! Raspberry Champagne Cake – champagne infused cake with raspberry champagne buttercream, raspberry drip glaze, fresh raspberries and whipped cream. Preheat oven to 350 degrees. Butter and lightly flour three 8″ round pans. In bowl of stand mixer fitted with the paddle attachment, beat the butter and sugar on medium speed 4 minutes until light and fluffy. Add egg whites, one at a time, beating well after each addition and scraping down sides of bowl as needed. Add the vanilla extract and mix again. Gradually add the dry ingredients and the champagne, alternating, starting and ending with the dry ingredients. Mix until just combined, being careful not to over mix. Bake for 23-25 minutes, until toothpick inserted into center comes out clean. Place raspberry puree and champagne in a saucepan over med-low heat. Simmer, stirring occasionally at first and watching carefully as to not bubble over. All those champagne bubbles! Continue to simmer, while stirring, until reduced by half. You should have 3/4 cup remaining. Set aside to cool. This reduction is used in the buttercream and the glaze. Add in 1/2 cup raspberry reduction and vanilla. Mix well. Remove 3 to 3 1/2 cups of frosting from the mixing bowl and set aside. This will be the plain pink frosting for the outside of the cake. Add 3 ounces fresh raspberries to remaining buttercream in mixing bowl. Mix on low speed for just a moment, until raspberries start to break up. You should have chunks of raspberry throughout. This will be the filling for between the cake layers. In a small bowl, combine raspberry reduction, confectioner’s sugar and vanilla. Whisk until smooth with no clumps. Add additional water or corn syrup until desired consistency for drizzling. 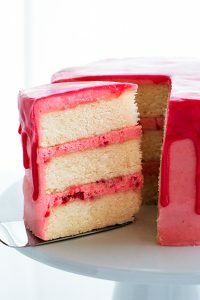 Place one layer of cake onto serving plate or cake stand and top with about one cup of raspberry champagne filling (the buttercream studded with chunks of raspberries). Repeat with second cake layer, more filling and then last layer of cake. Crumb coat and frost cake with the reserved raspberry champagne frosting (the plain pink buttercream). Refrigerate for 20 minutes or until frosting is set. Drizzle glaze over the top with small drips overflowing the edge. Refrigerate for 20 minutes or until glaze is set. When ready to serve, garnish with whipped cream and additional raspberries. Baking the cake in three 8″ round pans creates shorter layers that do not need to be torted (cut in half horizontally). The corn syrup adds shine to the raspberry glaze while making the pouring consistency smoother. This cake looks heavenly! 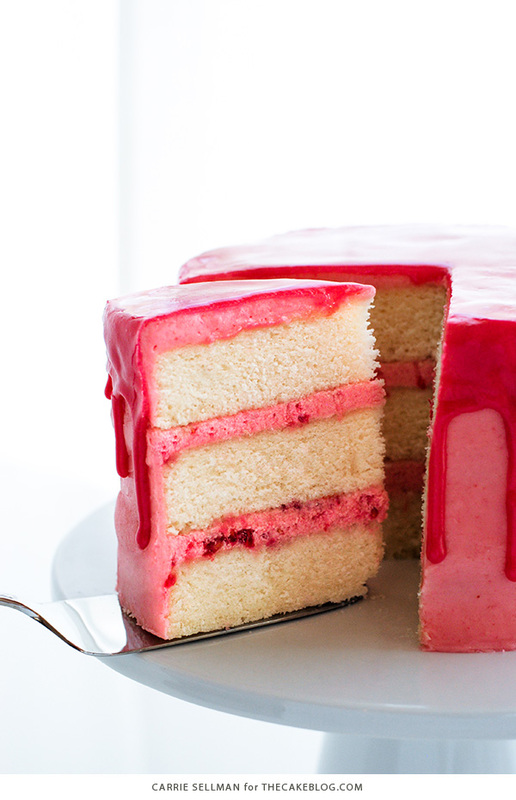 Is it okay to omit the fresh raspberries in the buttercream? Sure, you could omit the 3 ounces of fresh raspberries stirred into the buttercream at step #6. But you’ll definitely want to use the raspberries in the champagne reduction. Frozen raspberries should substitute just fine in the reduction, if needed. Just thaw them in advance. WHAT IF YOU CAN’T FIND RASPBERRY CHAMPAGNE??? This recipe uses regular, classic champagne. The raspberry flavor comes from fresh raspberries. Enjoy! This looks Devine! Would this work for cupcakes? Sure, this recipe should make around 24 cupcakes, give or take a few. Fill cupcake liners 2/3 full with batter and bake at 350 for 18 minutes or until toothpick inserted in center comes out clean. Thank you for taking the time out of your busy day to reply. I have used and continue to use your recipes. ALWAYS FANTASTIC! Does this taste “champagnei”?! I know this sounds a silly question, after all it is champagne cake, but I’ve been left so dissapointed in the past by recipes both sweet and savoury that contain alcohol that you can’t actually taste once cooked. I really want to make this for valentines day. It’s very unlikely the champagne taste is going to come through in any of it. It definitely won’t come through in the buttercream where you add butter and six cups of powdered sugar. I’m guessing it’s used mainly as a leavener in the cake, which could also be achieved with seltzer water. If it is a flavoring in the cake, it’s just going to come through as slightly yeast-y once baked. As for the drizzle, you’ll get a bit of the flavor in it, but not much. I’d use a very cheap champagne for this. Or vodka, if you would like a cleaner raspberry flavor. Awesome cake, turned out really well. Thanks for the recipe. Made today for Women’s Day celebrations at work n people just loved it!!! Hello, can I substitute raspberry with strawberry or do a mix of both? Much thanks. Sure, strawberries would be delicious! I love the look of this cake! I’m making my daughters wedding cake and would like to do something like this for one of the tiers, so minus the glaze. What would you suggest, because the glaze is part of the frosting, so if I cut that recipe in half? Also, what is cake flour, is this plain flour – also knows as all purpose? 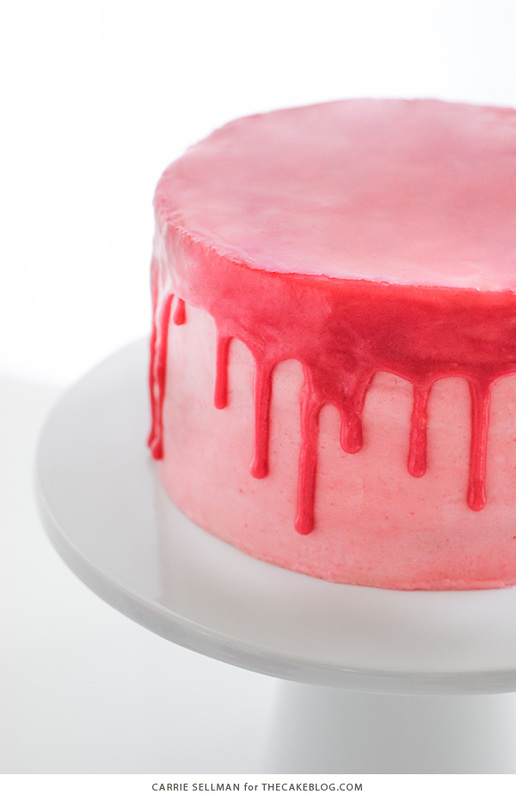 The raspberry champagne reduction is used in both the frosting and the glaze. But since only 1/4 cup is used in the glaze, my best advice is to make the reduction as written and you’ll have a little left over. Cutting the recipe in half won’t give you quite enough for the frosting. Cake flour is more finely ground flour with a lower percentage of protein than all-purpose flour. You can find it in most grocery stores. Here’s an article explaining the differences in flours and how they affect your cake recipes. If you need cake flour, an easy substitution is replace two tablespoons of every cup of flour with cornstarch. Make sure you mix it in well. I want to make this for my sisters wedding cake. Will this hold up well at room temp for about 5 hours? Will this cake go well with stacking as 3-tier? Thank you! Hope to hear from you soon. Kathy, did you end up making this as a wedding cake? I am making a Champagne wedding cake and have a favorite recipe but am considering other options and I am a bit worried about a 3-tier stack. Did this one work for you? I am wanting to use my 6″x3″ pans. Do you think this recipe would be enough for 3 layers if I use the 6×3″? What does the corn syrup do for the glaze? What happens if you leave it out versus using it? Great recipe! Thanks a lot, did it for my mom’s birthday and everybody loved it! Excuse me while I clean up my keyboard. Drooling over here! 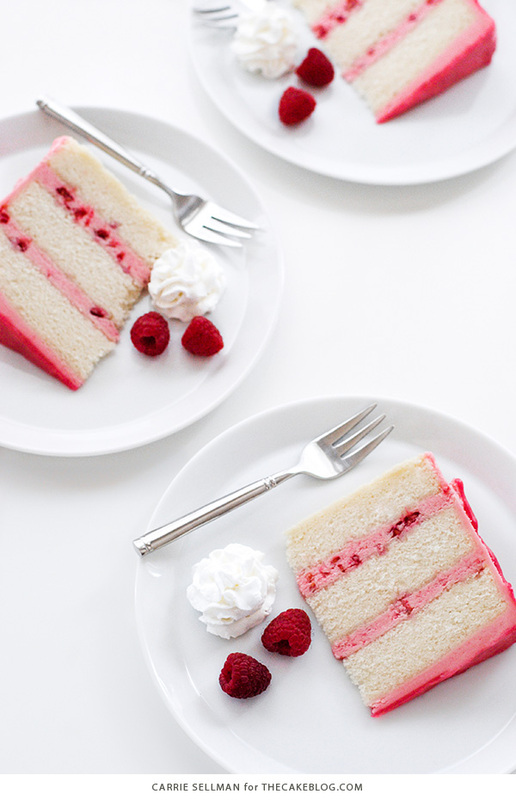 I am just dying to try a pink champagne cake! They look so adorable and I bet it tastes amazing! Pinning this recipe for later!! !